But the Labour leader said he will also continue to push for "other available options" including a general election. John McDonnell said the party would table an amendment for a referendum when the "meaningful vote" on Theresa May's deal returns to Parliament. The shadow chancellor also told ITV's Peston show he would vote for remain. It came as MPs voted to endorse Theresa May's Brexit strategy - but only after she made a series of concessions. 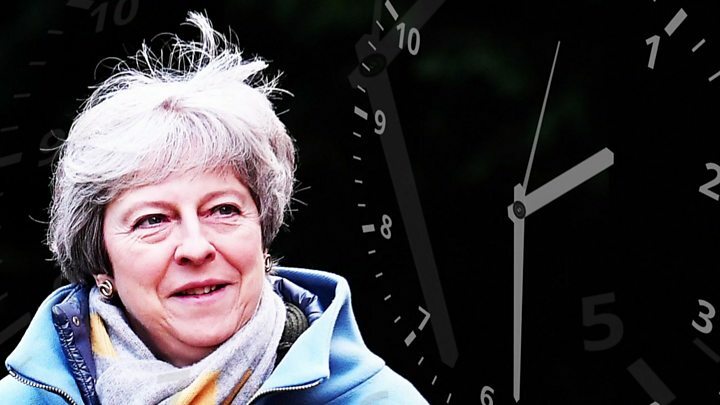 The PM also faced a Brexiteer rebellion, after 20 Tory MPs voted against proposals, backed by the government, to delay the UK's 29 March departure date if there is a no-deal scenario. But Conservative MP Jacob Rees-Mogg, who was not among the 20 Tory rebels, although he did abstain in the vote, offered an olive branch to Mrs May, as she continues to seek concessions from the EU on the controversial Irish backstop clause. The chairman of the European Research Group of Brexiteer Tories said he disagreed with those who were demanding changes to the legal text of the withdrawal agreement and would accept an appendix to it. Image caption Is Jacob Rees-Mogg softening his stance? Writing in The Daily Mail, he said: "I really do not mind what form of words the Attorney General and the EU agree on regarding the backstop - as long as it expires before the next election and has the same legal status as the deal." Other leading figures in the ERG, including deputy chairman Steve Baker, have previously dismissed the legal annex to Mrs May's agreement being negotiated by Attorney General Geoffrey Cox. Labour's Brexit proposals - which would see the UK join an EU customs union - were defeated by 323 votes to 240, a bigger margin than the last time MPs voted on them. Mr Corbyn confirmed to MPs on Monday he would back another public vote if such a defeat took place - after resisting calls to do so from pro-EU Labour MPs. 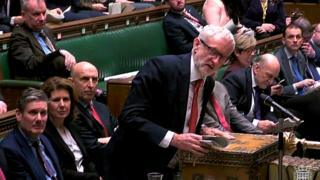 After Wednesday's vote, Mr Corbyn said: "We will back a public vote in order to prevent a damaging Tory Brexit or a disastrous no deal outcome. Labour MPs Peter Kyle and Phil Wilson have put forward a compromise plan to back Mrs May's deal with the condition that it is then put to a confirmatory public vote. Former shadow cabinet minister Owen Smith, a longstanding critic of Mr Corbyn, said: "Now that Labour's version of Brexit has been rejected by Parliament, I expect Jeremy Corbyn to throw his full weight behind campaigning for a public vote." Labour MP David Lammy, a supporter of the Best for Britain campaign for another referendum, said: "It's become clear today that there is no majority in the House for May's deal, but also that Labour's alternative plan cannot command a majority either. "In the key votes ahead of us we must extend Article 50 to take a catastrophic no-deal off the table and use that time to put this decision back to the people to decide if they back the government's botched Brexit deal or staying in our current EU deal." But Labour former minister Caroline Flint said the party should not back a further referendum despite the defeat of Mr Corbyn's plan. She said: "I think the British public want us to get on with this and sort out a deal that works." She said Labour's leadership should "engage in negotiation, to use the leverage you have got, to get a better deal". MPs also rejected an SNP motion saying the UK should not leave the EU without a deal "under any circumstances" - by 324 votes to 288. Labour MP Yvette Cooper's amendment, which the government supported, was backed by 502 votes to 20, with a small group of Tory Brexiteers voting against it. The amendment contained Mrs May's commitment on giving MPs a vote on delaying Brexit if both her deal and no-deal are rejected by MPs. Mrs May announced this policy as she promised MPs a meaningful vote on her deal by 12 March - just 17 days before the UK is set to leave the EU. The move was designed to head off a possible defeat when MPs voted on Ms Cooper's amendment. Media captionDid Theresa May's latest statement rule out a no-deal Brexit, and what might happen next? Ms Cooper did not drop her amendment, because she wanted to hold the prime minister to her word - although the government has said it accepted the proposal. Conservative MP Alberto Costa's amendment, which seeks to protect the rights of UK citizens in the EU and vice versa, even if there is a no-deal Brexit, was nodded through by MPs, after the government said they supported it. Mr Costa said he was still forced to resign as an aide to Scottish Secretary David Mundell because of a convention that members of the government cannot table amendments to government motions. Conservative MP Caroline Spelman opted not to put her amendment - calling for the PM's promise to give MPs a vote on delaying Brexit to be made legally binding - to the vote, after reassurances by the government. Conservative Party chairman Brandon Lewis accused Jeremy Corbyn of being "happy to ignore the biggest democratic vote in our nation's history" by saying he would back another referendum.